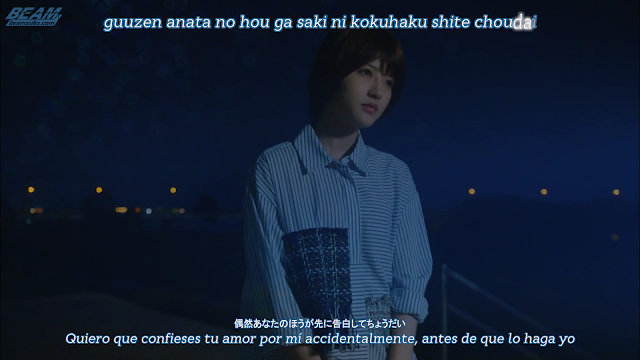 Wakatsuki Yumi's last song as a Nogizaka46 member. She is joined by long time friends Sakurai Reika, Akimoto Manatsu and Nakada Kana. Just like all recent members who've announced graduation, we wish them all the best in the future and nothing but happiness in whatever path they choose to take in life. La última canción de Wakatsuki Yumi como integrante de Nogizaka46. Es acompañada por sus amigas cercanas Sakurai Reika, Akimoto Manatsu y Nakada Kana. Al igual que todas las integrantes recientes que han anunciado su graduación, les deseamos lo mejor en el futuro y nada más que felicidad en el camino que elijan tomar en la vida.